To demonstrate that everybody can do something for a more environmentally friendly world, this year employees at ebm-papst offices around the globe are organizing Every Day is a Green Day campaigns, developing unique ways to demonstrate our shared GreenTech philosophy. Next week (June 11-16) is our time to celebrate Every Day is a Green Day with a special week at ebm-papst’s U.S. headquarters. We’ve got a full lineup of activities, including the kickoff of our Every Day is a Green Day Video Contest. Students 13-18 years of age who live in Hartford County can enter the contest by submitting a brief video showing the creative ways they incorporate green practices into their lives at home and school. Deadline to submit videos is August 11; winners will be announced on August 27. 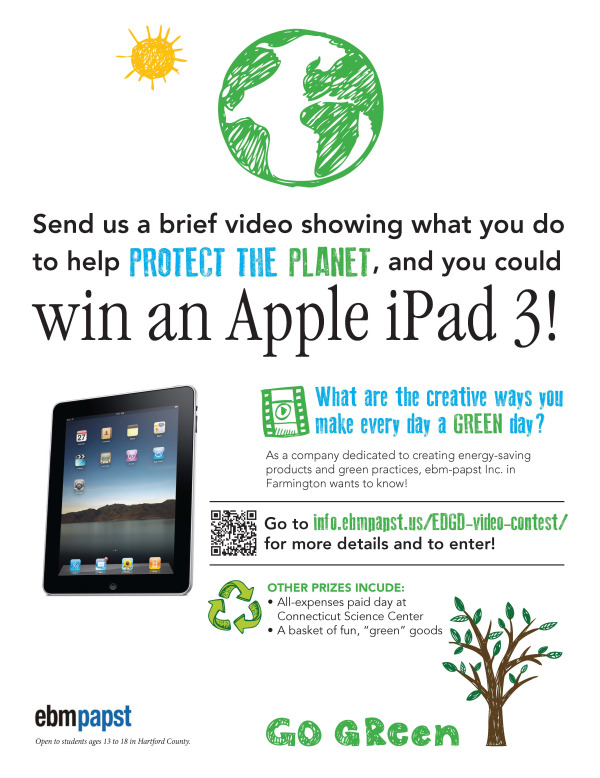 The student who submits the most compelling green video will receive a grand prize of an iPad 3 (16GB WiFi model). The second prizewinner will win a family trip for four to the Connecticut Science Center, including lunch for four at the museum’s Café and four tickets to a performance at the IMAX Theater. The third prizewinner will receive a ‘green’ basket of environmentally friendly products. Check our Faceboook page regularly to view students’ ‘green’ videos! We’ve launched a “How are You Green?” contest for employees, who are submitting their green living practices and tips, and a Green Trivia contest. Employee winners will be announced for both contests on June 15. An adventurous team of seven ebm-papst employees will scour the fields around our facility on June 12 or 13 and remove trash wherever they find it. During a green luncheon and employee social at our facility on June 13 we’ll be using locally sourced burgers and hot dogs from Saint’s in Southington. The Super Natural Market and Deli will deliver locally sourced ingredients for strawberry shortcake! Employees will bring their personal documents for shredding by Cintas, which will have a truck on site between 3 and 4 p.m.
Also on June 13, from 11:30 a.m. to 4 p.m., employees will be able to purchase energy efficient lighting from Collinsville-based TechniArt, Inc. during a Lighting Fair, with displays in our café and at the receiving/loading dock. Here’s wishing you a summer of exploration, relaxation and green living!